Any organization can innovate once. The challenge is to innovate twice, thrice, and more - to make innovation a part of daily good practice. This book shows how nonprofit and government organizations can transform the single, occasional act of innovating into an everyday occurrence by forging a culture of natural innovation. 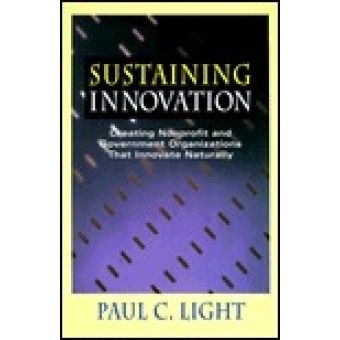 Filled with real success stories and practical lessons learned, Sustaining Innovation offers examples of how organizations can take the first step toward innovativeness, advice on how to survive the inevitable mistakes along the way, and tools for keeping the edge once the journey is complete. Light also provides a set of simple suggestions for fitting the lessons to the different management pressures facing the nonprofit sector and government. Unlike in the private sector, where innovation needs only to be profitable to be worth doing, nonprofit and government innovation must be about doing something worthwhile. It must challenge the prevailing wisdom and advance the public good. Sustaining Innovation gives nonprofit and government managers a coherent, easily understandable model for making this kind of innovation a natural reality.